We are one of the leading sterile swabs manufacturers and exporters, from India. We are specialized in the manufacturing of sterile swab. 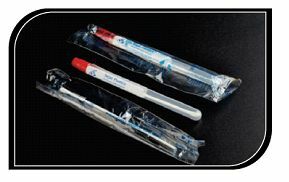 In addition, we also provide sterile transport swabs which have wide application in local as well as international market. Fine 100% cotton single tipped cotton buds with cotton wrapped on flexible polypropylene sticks are individually packed. Our swab transport systems are perfect for all of your aerobic and anaerobic microbiology transport needs. Easy to use, Round bottom for easy racking & Write-on label for sample identification and accurate reporting.